This post only reviews the free version, playing as a guest, not as a registered player. The app only requires limited permissions, which I like. Ads do get annoying, as they sometimes jump to half the screen size, but you can click “hide ad” to dismiss these. A subset of these games involve high-level use of English: Speed Trivia, Vocabulary Star, Word Memory, Abstraction, and Vocabulary Power. Here is a description of these games and how you might use them to enhance your fluency in English. Speed Trivia (unlimited play in free version) Answer questions by sorting the four mixed-up letters (or letter sequences) in the answer. Thus there is vocabulary retrieval and spelling knowledge tested. Here is an example item. “What activity other than jumping are kangaroos good at? oxi g n b → boxing.” I wish that the letter combinations were divided by syllables–it’s much harder (and probably not as productive for making sound/spelling connections and memory) to compose words with groups of letters that cross syllable boundaries. Nonetheless, this is a fun game that does involve a wide variety of vocabulary. Vocabulary Star (unlimited play in free version) Each round is three minutes. The game interface is just like Speed Trivia, but instead of a trivia question & mixed-up answer, you get a definition and a mixed-up word. This one may be more useful for fluency if you try to think of possible answers before looking at the four sets of letters at the bottom of the screen. Word Memory (unlimited play in free version) This game is designed to train “working memory” to hold lots of words at-the-ready. Whether it achieves that is questionable, but it is likely to be much harder to do this game in a second language, and if you can make connections between words or combine them in sentences to remember them, you may actually have a positive impact on your English fluency & vocabulary retrieval. So, you get three lists of ten words to memorize, for a total of 30. Then in the next part of the game, you see a word on your screen and have to tap a button to indicate if the word was on the lists or not. One of the words on my list the first time I played was “peen,” which I’ve never seen before, but which I remembered was on one of the lists. This helped me remember to look it up later. It’s part of the head of a hammer. Abstraction (only available 3 times free) You see a bunch of words, and for each one, you press a button “abstract” or “concrete” to categorize the primary meaning. This is a useful vocabulary game, because it forces you to apply a binary sort on a broad variety of nouns based on their meaning, and thus can improve retrieval of those words when you need them for speaking. The game can also be helpful for grammar–when to use a/an and when is it unnecessary? Most abstract nouns are non-count, and articles work differently in English for count and non-count nouns, so this game is useful for distinguishing and remembering count and non-count nouns. (Some concrete nouns, especially those that denote substances, are also non-count, like “water.” Conversely, some abstract nouns have both a countable and an uncountable meaning: “The only thing to fear is fear itself” uses the verb and the non-count noun for a generalization, while “I have many fears about my future” uses the count noun. Many abstract nouns, in fact, have a count and a non-count version. There are also abstract ideas like “an attitude” which are countable, so this is only a tendency, not a rule). Pay attention to the suffixes (word endings) that are frequent in the abstract nouns. When you hit play, you get text instructions. There are some weird words, like “double-hung window,” which is only relevant if you need to buy a window-mounted air conditioner or buy new windows, and “propinquity,” which I’ve never had occasion to use, but most words are relatively frequent, with a combination of everyday and more academic terms. The first time I played, I scored in the 18th percentile, so don’t get discouraged. 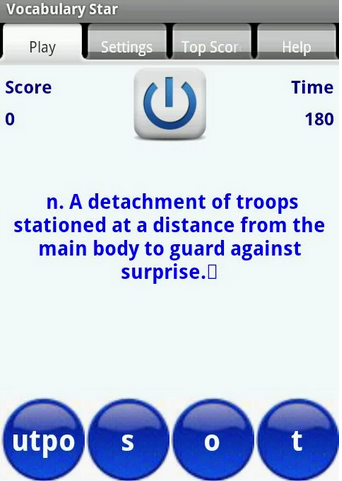 Vocabulary Power (only available 3 times free) While this app does have solid definitions/synonyms, it’s just a multiple choice meaning matching game, and there are dozens of these out there, so nothing special. I’d play it three times and be done. Categories: Android, Suggested Apps | Tags: Abstraction, academic, Android, Count noun, english, English fluency, fluency, Noun, spelling, vocabulary, Word | Permalink.